Let's back this up for a sec. Zach dreamed up the Miss Softee + Treats Truck ice cream sandwich and after some back and forth tweets this week it it looks like it's good to happen tomorrow. 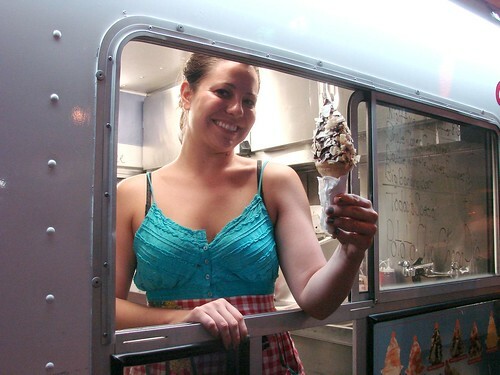 When I was by Miss Softee's truck the other night she confirmed the Thursday alliance saying that she and the Treats Truck were going to make Oreos--Kim would be baking the cookies and she'd be providing the ice cream squirts. Not sure if that's still the game plan or if they've cooked up another sinfully delicious treat, but according to Miss Softee's twitter, the full details will be up this morning and there will be limited quantities, so come early. Your best bet is following Miss Softee or The Treats Truck or keeping track of all of the midtown food shenanigans via the Midtown Lunch Twitter Tracker. Potato chip cone just made my summer. Oh PLEASE get us the potato chip choc chip cookie recipe! 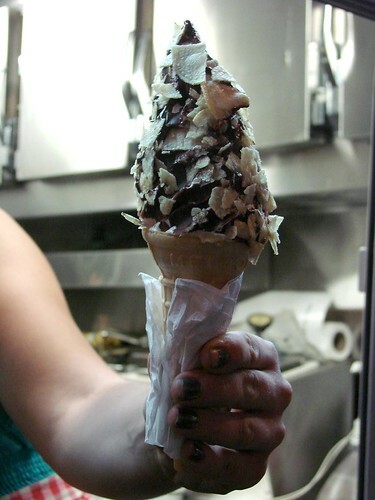 When does Miss Softee have the chip dipped cones again? HEAVEN!!! OMG crisps on an ice cream.... genius idea! @stacie joy: wooohoo! I hadn't seen that.